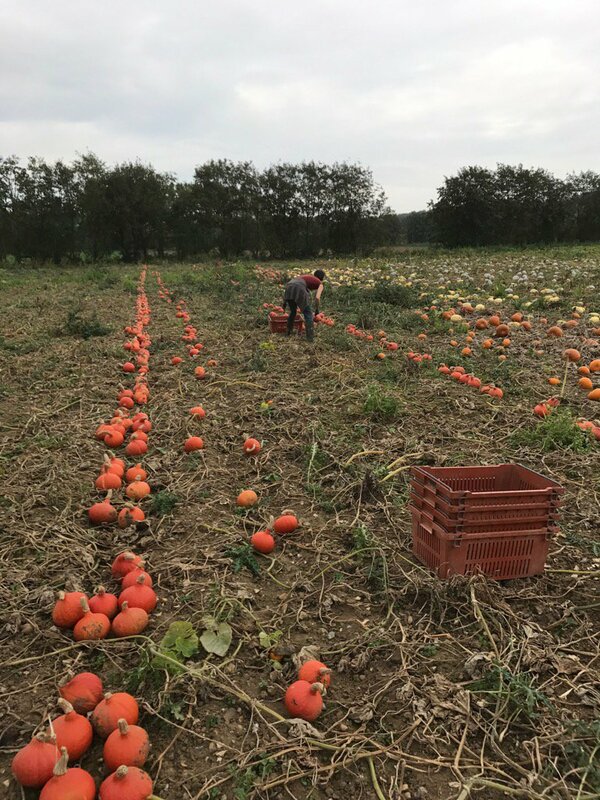 It’s that harvesting time of year – although we’re out in the fields harvesting some crops 6 days a week, September to November sees us harvesting potatoes, onions and squash for winter storage. We’ve got all of our onions in store now, some of the early crop grew to a good size but the later crop is on the small side this year. We’ve not harvested as many potatoes as we’d like yet due to a combination of wet conditions and a potato harvester that is showing it’s age and keeps breaking down (that’s happening to some of us workers too!). Less time spent harvesting potatoes means we have had more time to harvest squash, so have made a good start on that and have lots in store already. Our annual Farm Walk will be on Sunday October 29, location to be confirmed. A reminder and directions will be in the boxes nearer the time. There will be a farm walk with Martin, apple bobbing and tea, coffee and juice provided. Come prepared for whatever the weather throws at us. Chard – the rainbow and green chard is the perfect size for bunching at the moment, good for you as you get the lovely stems as well as the leaves (2 veg from one) and good for the environment as it’s one less plastic bag used. The stems are good sautéed, or cut fine and stir-fried or steam for a bit longer than the leaves. They’re tasty in a quiche or a curry. Small amounts cut fine and added to a salad for crunch and colour work well too. I’m going to try a recipe for pickled chard stems soon – will report back.